It came to my attention that yesterday, October 1oth, was World Porridge Day. While it is unlikely I’ll post a porridge dish any time soon, I indeed had on archive something that called for oats. It is a super easy recipe of home-made breakfast by Nigella I first saw on Canela moída. I tend to avoid this sort of snacks, no matter how many claims of “healthy food” they have. Most of the times they are too sugary, too chewy, too fatty, too synthetic, too caloric…. But, this home-made one is almost a guilt-less treat, packed with different flavors and textures. A healthy sugar-rush, if you will. As usual, a few tweaks. 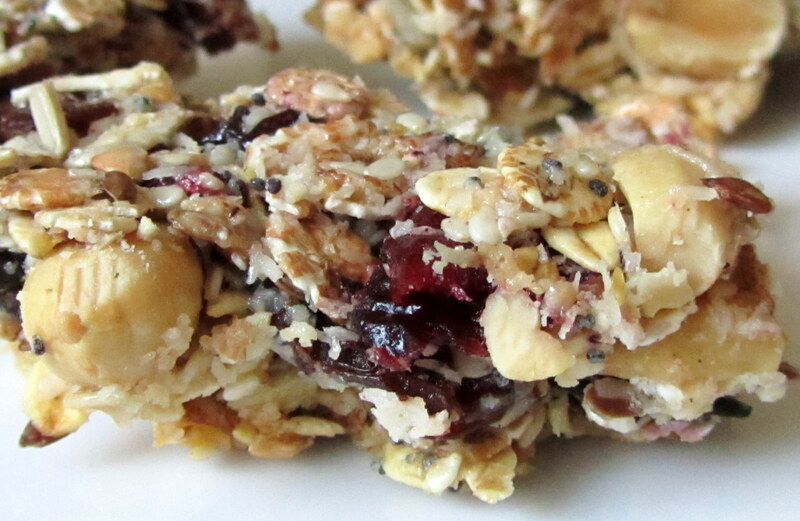 Cranberries are difficult to source in this part of world, so I used muesli oats with added fruit. But, this is the type of dish you can do with your favorite ingredients, as long as you keep the proportion of solids and condensed milk the same. It is very quick to do, but it takes about one solid hour to bake and another one to get it cool. Be warned: once you start doing this, there is no back to the vending machine to get a plastic one. 350g oats (not instant) with 50% added fruit, including a lot of cranberries (original recipe called for 250g rolled oat and 100g dried cranberries. Spread the mixture into the tin and press down with the spatula or, better still, your hands to even the surface. Just make sure you are wearing disposable vinyl gloves to do this, otherwise you will end up with the sticky oats all over your fingers.